Well this is my first time building a ported box, I'm used to taking the easy way and going sealed. First of all I'm running two NVX VCW 104 subs. Should I make the box with the recommended air space for the subs, or is it better to go bigger? This is going to be a wedge type box, it is going behind the seat of an f350 pickup. The problem I might have is finding a place to put the port, and is there a difference where I put the port???? Make the box to the recommended specs for the subs,(bigger is for SPL applications only) tuning of the enclosure will depend on what type(s) of music you listen to. Be specific then I can recommend tuning for the vent. The box will be 2.3 cubic feet. I will give ya the box specifics if you need them when I get home, thanks! Perfect! How do I figure out port dimensions? Give the max dimension of the space you have to work with, Height, width, and depth? This is what my box will look like. All dimensions are in inches. 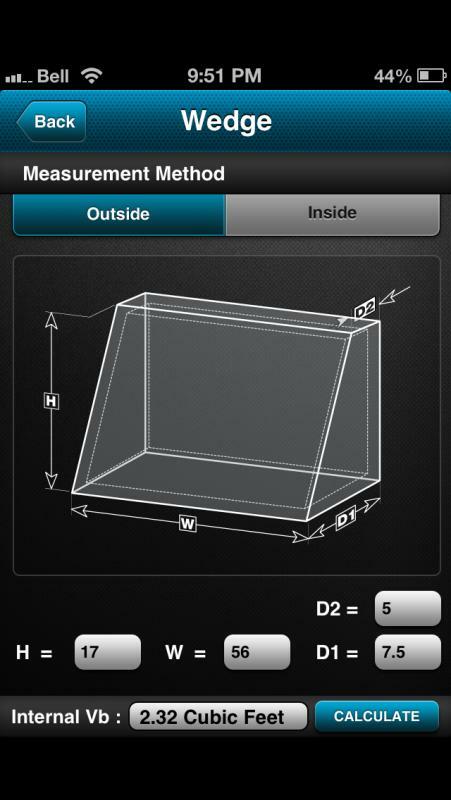 As Sonic has said, in order to calculate a slot port we need a height, width, and depth of your enclosure.